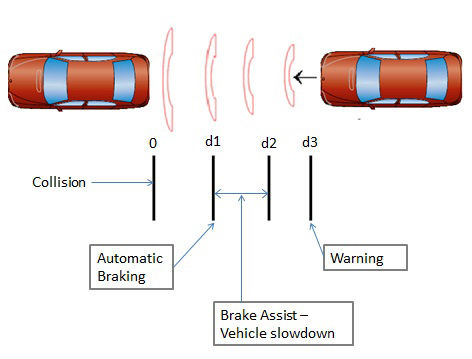 What is Autonomous Emergency Braking System? Autonomous Emergency Braking system is an active safety system. It is specifically designed to avoid rear-end collisions. It also has another name which is Predictive Emergency Braking System (PEBS). Why use Autonomous Emergency Braking? A car travelling on a highway during rush hours usually collides with the next vehicle if anything/anyone distracts the driver even for a second or so. He/She may be doing some other tasks such as changing the audio settings or keeping something in glove box etc. Suppose, that the vehicle is travelling at a speed of 80kmph and driver loses his/her attention for one second. The distance covered by the vehicle during that one second is slightly more than 22 meters. Allowing the vehicle to run without any supervision may prove to be fatal. Its because the chances of encountering an accident increase tremendously in such a situation. Various accident studies show that in the majority of the incidences of rear-end collision, driver of the colliding vehicle did not apply brakes with the desired pressure or have not used them at all. Thus, it is the distraction or the loss of concentration that has resulted in the collision. To avoid such mishaps, engineers invented the Autonomous Emergency Braking system. Autonomous Emergency Braking system works with the help of the radar or cameras mounted on the vehicle and Electronic Stability Program (ESP). Radar system or cameras continuously monitor the traffic ahead. The system senses that inspite of seeing a vehicle ahead, the driver is not decreasing the speed of the vehicle under consideration. Then, it warns the driver by issuing an alert in the form of a visual signal on the instrument panel in the first stage of operation. Even then if the vehicle continues to move ahead, the AEB takes over the control of the vehicle and with the help of ESP, it applies brakes to the vehicle thereby avoiding its collision with the next vehicle. Autonomous Emergency Braking system assists the driver right from the start of the journey and at all speeds. It is seen that the cases of rear-end collisions have significantly reduced after implementation of this system. Home » Technical Anatomy » How Autonomous Emergency Braking System (AEB) helps to prevent a collision? What is a Fuel Cell Electric Vehicle and how it works? Know More. Engine Sensors: Which Are Different Engine Sensors And How They Work? What is an asymmetric tyre and what are its benefits?